Choose train or trolley to embark on an hour-long tour of Key West and 100 of its key attractions and historical sites. After taking in the sights, guests will stop at Mallory Square, where they will be provided with admission for self-guided visits to the Key West Aquarium and the Key West Shipwreck Historeum. 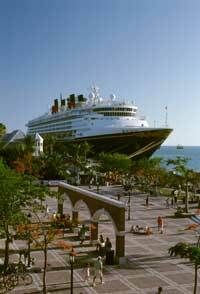 There is an approximate 5 minute walk to Mallory Square where the guests pick up the train or trolley for their tour. It's like a window to another world. The Pride of Key West, a 65-foot glass-bottom catamaran, gives guests an incomparable view of the underwater world of the Keys. This comfortably appointed vessel boasts upper and lower sundecks, a large climate-controlled viewing area, snack bar and restrooms on board. Guests just need to sit back and relax as they enjoy this two-hour narrated eco tour of North America's only living coral reef. Snacks and non-alcoholic and alcoholic beverages are available for purchase. Guests are taken directly from the pier to the Catamaran. For guests who are the seafaring sort, this is the best way to experience the magic of Key West. Guests will enjoy a three-hour sailing adventure aboard a 65-foot catamaran that includes spectacular snorkeling in the crystal-blue waters amid vibrant coral and tropical fish. Snorkeling equipment and professional instruction provided, as well as non-alcoholic beverages. The snorkeling equipment provided includes fins, snorkel, mask and a horse collar vest. Guests snorkel from the boat. There is 1 instructor to 25 guests. Price: $50 (10 yrs & up) Child (5-9): $29 No one under age 5. Train or trolley? Take your pick--either one will take you on a fascinating 60-minute tour in the southernmost city in the continental U.S. Guests will see 100 points of interest, including attractions and historical sites such as Hemingway's Key West abode, the famous Sloppy Joe's and more. There is an approximate 5 minute walk to Mallory Square where the guests pick up the train or trolley for their tour. A 21st century conservatory is yours to explore. You'll see beautiful butterflies,colorful birds, tropical fish and lush plant life. At the Key West Aquarium, you'll discover the intricacies of the native eco-system. You can even pet a shark at this unique destination.